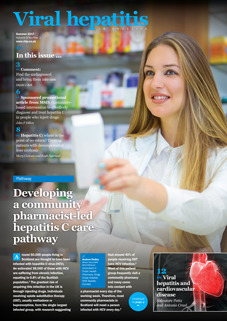 Launched in 2009, Viral hepatitis in practice provides a rich blend of articles of interest to all those involved in this area of medicine, largely in secondary care, but also in primary care. Supported by a multidisciplinary Editorial Board, and headed by highly respected Editors, the journal offers updates, guidance and practical advice that reflects current thinking in the field of hepatology. The latest issue of Viral hepatitis in practice is available free of charge in print (UK only) and online, and can be downloaded as a PDF or EPUB to view on your computer, tablet or smartphone. David J Bell PhD MRCP Consultant in Infectious Diseases, Queen Elizabeth University Hospital, Glasgow. Ahmed Elsharkawy BSc (Hons) BM (Hons) MRCP PhD Consultant Hepatologist, University Hospitals. Birmingham NHS Foundation Trust, Queen Elizabeth Hospital, Queen Elizabeth Medical Centre. Brendan Healy VMRCP FRCPath MbChB (Hons) BSc(Physiology) Consultant in Microbiology and Infectious Diseases, Public Health Wales Microbiology Cardiff, University Hospital of Wales. Geoffrey Dusheiko VMB BCh FCP(SA) FRCP FRCP(Edin) Professor of Medicine and Honorary Consultant, Centre for Hepatology, Royal Free Hospital, London.